A 24-year-old farmer working in the hills of Baguio District, outside Davao City limits, has shot and wounded Matatag, an adult male eagle which was released into the wild in 2015. Tiburcio Aparesio told authorities that he ‘accidentally’ shot the Philippine Eagle after bringing it to the Philippine Eagle Centre in Malagos – admitting he shot the bird with his .22 calibre rifle. 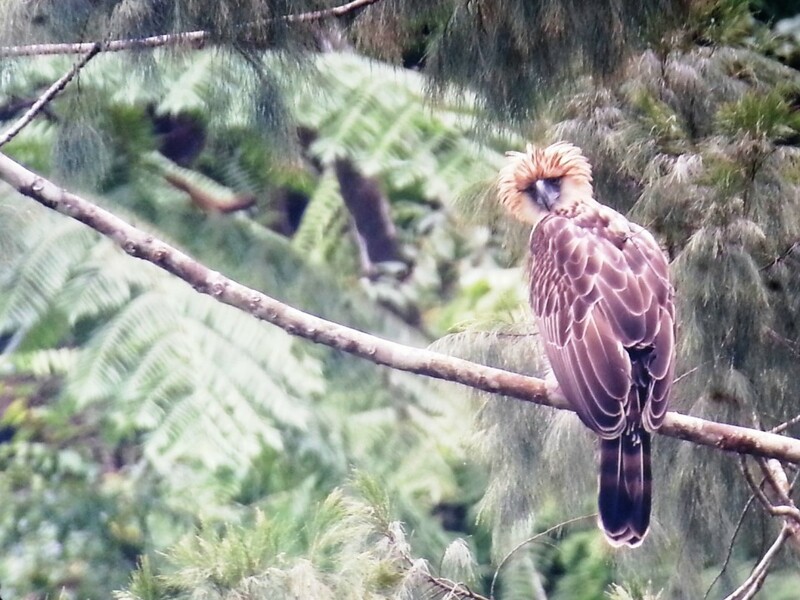 Matatag was a rehabilitated Philippines eagle that was released into the wild in Mount Apo just last year. The bird is said to have migrated 13km north of its original destination, making home in the territorial borders of the Obu Manuvu community in Barangay Carmen, Baguio District. Authorities said the bird appears to have been shot in the right wing. Baguio District Police said the young man quickly informed them that he has accidentally shot the eagle and they in return informed the eagle centre. Police now say that the farmer’s younger brother may have been involved in shooting and both are now being detained at the Baguio District police station for violation of Republic Act 9147 (the Wildlife Resources Conservation and Protection Act. Police say a witness to the incident backed up the fact that the young brother shot the bird, not Aparesio. Workers at the eagle center said ‘Matatag’ was responding well to medication. Dennis Salvador, Philippines Eagle Foundation executive director said the shooting underscores the problems associated with saving the Philippine Eagle from extinction in an ever declining population throughout the country. Once rehabilitated, ‘Matatag’ will once again be released back into the ancestral forests of the indigenous Obu Manuvu tribe in the hinterlands of Baguio District. Contained in this post is the ongoing exchange of letters in the Philippine Daily Inquirer on the topic of the dispersal of Philippine eagles by the Philippine Eagle Foundation (PEF). I am arguing for the stoppage of the program until the safety of the release birds could be assured while Jayson Ibanez of the PEF is defending the program. As this last eagle shooting happens, I am waiting for Ibanez to reply to my second letter. The order of the letters is from top. Is PEF helping save PH eagles? ANIMAL LOVERS in the country and even other parts of the world warmly welcomed the birth of the 26th Philippine eagle in the Philippine Eagle Foundation (PEF) conservation center in Davao City last December, the first eaglet hatched in captivity in two years. Conservationists hailed the new eagle as a boost to the efforts to stave off the extinction of this species of raptor found only in the Philippines. Forgotten by the public was the pattern of freed full-grown eagles meeting their death, the last of which was Pamana, who died in August. This pattern has become regular in recent years, giving rise to the question of whether or not the PEF is actually helping in the mission to save the Philippine eagle from extinction. The shooting to death of five freed eagles and the electrocution of one in the last five years have not taught the PEF that releasing birds into the open is fraught with dangers and has far-reaching implications on the continuing existence of this bird species. Despite the incalculable losses coming in close succession, the foundation persists in the foolhardy assumption that there are still open spaces in the country where the Philippine eagle could be safe to fly and find a mate and, therefore, be a factor in increasing the population of this endangered species. The PEF made much of the reward money raised for the apprehension of the person who shot Pamana. While it is always good for offenders to get their comeuppance, it is highly doubtful if the prosecution and even the punishment of the culprit could impact on the efforts to conserve the Philippine eagle. The more pressing and prudent action that the PEF should have taken after the death of Pamana and other freed eagles was to stop the practice of releasing eagles unless and until an area wide enough for the birds to live and breed, and beyond the reach of human predators on a 24/7 basis, has been established. If, as Salvador said, the PEF will continue to release eagles sans such an assurance, the birth of Chick 26 is likely to be for naught except for the pleasure it will afford animal lovers while it remains in captivity. Needless to say, without a change in the position of the PEF, Chick 26 and the other eagles in the care of the PEF face an uncertain future which bodes badly for the Philippine eagle. It is high time the PEF and other romantic animal lovers accepted that in this country, for as long as people view wildlife as just a source of meat and easy money, the only safe place for the Philippine eagle and other wildlife is in captivity. Firstly, there are areas still safe for eagles. For example, three eagles that we have released— “Matatag” at Mt. Apo, “Kalabugao” in Bukidnon, and “Raquel” in Isabela—are well and fully independent in the wild. Contrary to Albano’s claim that rural folks “would hunt down anything that moves for the table or for the market,” local forest guards at Mt. Apo and in Bukidnon watch over their eagles. The Philippine Eagle Foundation (PEF) helps conserve wild populations, too. To date, nearly 600 local forest guards protect 14 eagle pairs and their territories. They are definitely not the meat- and money-hungry savages Albano has portrayed. True, eagle “Pamana” died. However, the fault of one person or two does not make everyone potential wildlife criminals. Laws deter crimes, but only if fully enforced. Intensifying wildlife law enforcement—not giving up on the practice of releasing eagles —is, therefore, the more meaningful conservation reform. Secondly, on putting an end to the practice of releasing eagles in captivity due to the lack of open (vacant) spaces (habitats), it becomes clear that Albano’s grasp of this conservation tool is very limited. The release into empty habitats (reintroductions) is just one method. Another is “restocking” (releasing eagles where population numbers are low). We have yet to employ these approaches. Releasing rehabilitated adults back to their territories where they can breed again is another. We were successful in this. In North Cotabato, for instance, an adult female eagle, medicated in 1999, bred several times after release. Caging this bird forever would have been a case of wasted reproductive potential. “Assisted-dispersal” is when young eagles are moved from their birth place to protected forests. They then become “surplus” birds that replace old and dying adults. Pamana died, but one failed case does not negate the value of releasing eagles in captivity. Lastly, limiting the fate of releasable eagles to only two—a dead eagle or a captive eagle—is misleading. As I pointed out, releases can result in birds surviving and breeding in the wild. In summary, Albano’s bold call to “stop the practice of releasing eagles” is at best short-sighted and ill-informed. Albano would be better off removing his blinders. In trying to debunk my contention that releasing Philippine eagles into the open is foolish given the lack of safe spaces for them to thrive and the anti-wildlife mentality of Filipinos, Philippine Eagle Foundation’s (PEF) Jayson Ibañez shot himself in the foot several times with awesome accuracy (“In captivity, eagle’s potential killed,” Opinion, 2/10/16). First, he made it appear that the shooting to death of Pamana is an isolated case. The fact is, of the 10 eagles released by PEF since 1999, five were killed by hunters. Why Ibañez chose to give an incomplete picture I could only hazard a guess. Second, he disputed my description of Filipinos as unmitigated wildlife predators by citing the case of 600 local forest guards of 14 pairs of Philippine eagles. Obviously, he did not realize I was not referring to people sworn to protect wildlife as the term “forest guard” denotes, but to the people that make them necessary. More importantly, what’s 600 to the millions of Filipinos responsible for the near disappearance of our wildlife? Ibañez contradicted official PEF data on gunshots accounting for nine out of 10 Philippine eagle casualties (“Center seeks more space to save monkey-eating Philippine eagle,” phys.org, 2/8/16). Yet, the article “Ecology and conservation of Philippine Eagles” (online) in 2006, which he cowrote, pointed to hunting as “a major and deadly threat to the species,” noting that all the 11 eagles recovered by PEF since 1999 were victims of human predators. Against overwhelming evidence, Ibañez wants us to believe Filipinos have nothing to do with the inclusion of more than 40 species in the country in the critically endangered list. Ibañez said that in captivity, the reproductive potential of eagles is wasted. Then how come then that 27 eagles under PEF’s care bred in captivity? And why does the PEF want to expand the breeding center so they can pair more eagles, as the earlier-referred Feb. 8 phys.org article states? Ibañez alleged that released eagles can thrive and breed in the wilds. But the current score—four alive against six dead, including the one electrocuted—shows that releasing eagles is still a hit-and-miss proposition we can ill afford if we want to save the Philippine eagle. I am not for absolutely stopping the release of eagles. All I am saying is, we wait until the conditions for the birds’ safety from human predators, on 24/7 basis, shall have been met. The trouble with PEF is, it’s like an overexcited and overeager kid who cannot wait for such basic conditions to be in place before releasing the eagles, thus the unnecessary heavy toll on our hopes for the survival of the Philippine eagle species.